Use this form to request widget file for your website. Save the file "index.html" (can be renamed) and upload it to any convinient directory to server where your website is hosted. Widget file can not be modified or downloaded in frame, otherwise your widget will be blocked! A unique code for widget file is generated each time you press the "Save widget" button. You can have only one widget, so if you already use our widget on your website, after clicking the "Save widget" button your old widget won't work. Use this form to request a widget file for your website. Save the renameable file "index.html" and upload it to any convenient directory to of the server where your website is hosted. The widget file can not be modified or downloaded in frame, otherwise your widget will be blocked! Also, you can only have one widget at a time. A unique code for the widget file is generated each time you press the "Save widget" button. So if you already use our widget on your website, do not click the "Save widget" button or it will disable your old widget. 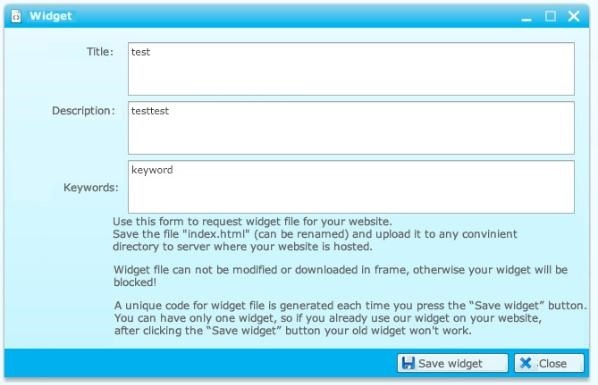 Use this form to request the widget file for your website. Save the file "index.html" (which can be renamed) and upload it to any convinient directory on the server where your website is hosted. The widget file can not be modified or downloaded in frame, otherwise it will be blocked! A unique code for widget file is generated every time you press the "Save widget" button. You can have only one widget running at a time, so if you already use our widget on your website, after clicking the "Save widget" button your old widget will be disabled. "The widget file can not be modified or downloaded in frame, otherwise it will be blocked!" -> I don't know what that means. Thank you very much, this really helps me a lot! Currently, when you start the widget a new window is opened where the widget works, if you will want to put the widget in frame -it will be blocked. this means that if you modify the widget file by editing the code, or if you try to put the widget in frame, the widget will be blocked and won't work. Do you mean an iFrame? Any, frame, iframe, div etc. it won't work inside a page. Please use this form to request the widget file for your website. Save the file "index.html" (which can be renamed) and upload it to any convinient directory on the server where your website is hosted. Be aware that the widget file can not be modified or embedded on a web page, otherwise it will be blocked.